The journalist and author Sali Hughes has a wonderful attitude towards beauty and feminism. I mentioned it when I talked about reading her book, Pretty Honest, and today I’m going to devote an entire post to it. Sali wrote a piece in the November 2014 issue of Glamour. It’s called ‘Brains. Equality. Lipstick.’ and I agree with everything she says: the idea that if you’re interested in beauty then you can’t be a feminist is ridiculous. What irritates me most about this idea is that it suggests a love of beauty dumbs you down and/or makes you shallow. How does the fact I like to buy make-up, wear make-up and write about make-up have any bearing on my intelligence? It’s possible for a person to have a range of interests, and if one of those things is beauty then so what? 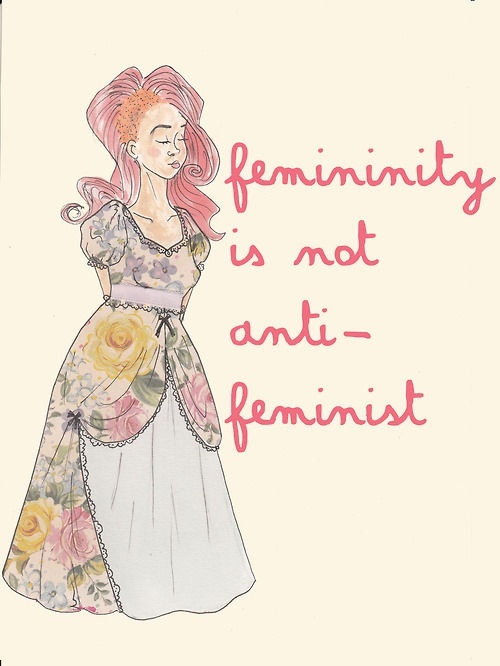 I’m also irritated by people who think an interest in beauty means you aren’t feminist enough. What this idea implies is that being feminine is something to be ashamed of; that kind of sexism is one of the many reasons we need feminism in the first place. I was under the impression being a feminist means you believe in the social, political and economical equality of the sexes. Why should my love of burgundy nail polish exclude me from this movement? I think there are far more important things to worry about than whether a woman likes to wear mascara or not. (Equal pay? Reproductive rights? Teaching young people about consent and respectful relationships, instead of blaming the victim?) Some of us wear it, some of us don’t, and it’s no one’s business but our own, unless we choose to share it. That we’re able to choose what we want to put on our faces is a victory in itself. If you want to be bare-faced, then be bare-faced. If you want to make red lipstick your signature look, then do it (it’s worked well for Gwen Stefani). You want to pile on the eyeliner and then rock a statement lip the next? Go for it. Feminism is about having the choice. Have you ever experienced any negativity about your love of make-up? What are your thoughts about beauty and feminism? Let me know in the comments.